Have you signed up to the Made Up Initiative set up by Karen over at Did you make that? Click on the link – or the logo in my sidebar – for more details. The goal was to raise £1,000 in a month in support of the National Literacy Trust. Made Up was launched on 13 August and has already raised £1,335 so who knows where it will be after four weeks! What Karen is asking everyone to do is make a donation on the JustGiving page and leave a comment stating a self-set challenge – it doesn’t have to be sewing or knitting but having looked at the early pledges most are. The deadline to complete your challenge is 10 September and there is a prize! I’ve always been an avid reader so this seemed like a great cause to be supporting. I’ve signed up to get my Brumby skirt finished by the deadline so I had better get my skates on. As previously mentioned, I had decided to make it from this fabric from The Eternal Maker in Chichester. I’m not sure now what it is but I think it might be this cotton/linen blend. 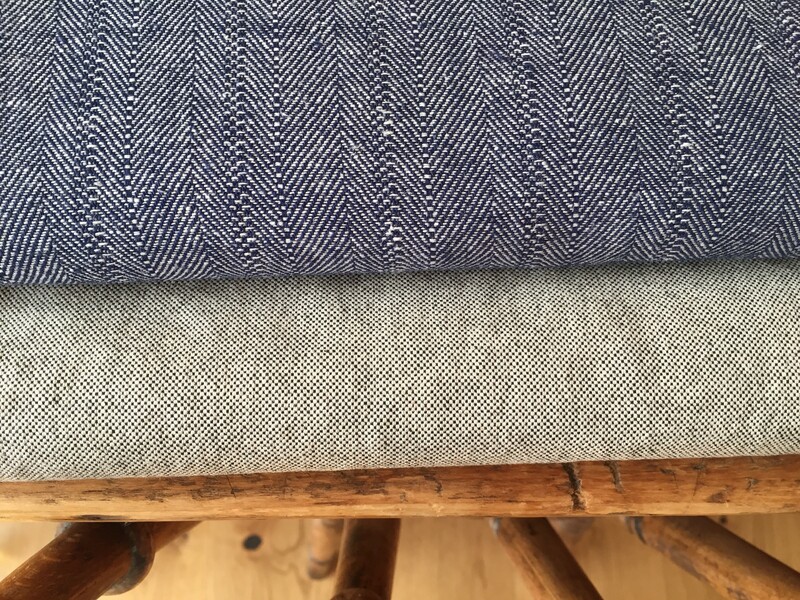 I also wondered about an organic cotton denim I bought from Raystitch ….. And then I went to the Open Day at The Fabric Godmother on Saturday morning and came away with yet another choice, the top one in this pile. One of the exciting things about this fabric is that it was cut by Zoe of ‘So, Zo …. what do you know?’ (and creator of Me-Made-May) who was helping to serve the long queue of sewists making purchases! Another is that it is a truly lovely fabric, a cotton and linen mix with an amazing drape. A slight disadvantage is that the weave does make your eyes go a bit funny! I’m afraid there were other purchases made, details to follow in another post. W was very patient, despite us getting stuck in traffic on the way to Hove. He found a patch of grass to lie on by the car park and read his book! I met another lovely blogger on Saturday, Clarinda Kaleidoscope, and we had a chat about exposed zips! Here’s to more Open Days in the future, the choice of fabrics was amazing. The final possibility for the Brumby is at the bottom of the above pile and was purchased from Ditto. We headed over to Brighton after the excitement at The Fabric Godmother to have lunch with my sister and I just couldn’t walk past the door! I’m really not sure about this one. I have learned my lesson and now wash everything before I cut it out and it has shrunk A LOT. It is quite stiff and I may turn it into an apron or bag rather than something to sit around in all day. Decisions, decisions. I shall make this particular one tonight. Here’s some more garden photos, this time from my sister’s town garden in Brighton. I take these images to make up for the fact that my own garden is rather uninspiring on the plant front! Another treasure trove of fascinating places to see/buy fabric. Hi, I bought one pattern on Saturday … It was the Brumby! No suitable fabric in my stash so guess I’ll need to go shopping again sometime soon! Good luck with the Brumby! We can share experiences – I may need some tips for the zip insertion!